A spiral galaxy like the Milky Way contains stars, stellar remnants, and a diffuse interstellar medium (ISM) of gas and dust. The interstellar medium consists of 10−4 to 106 particles per cm3 and is typically composed of roughly 70% hydrogen by mass, with most of the remaining gas consisting of helium. This medium has been chemically enriched by trace amounts of heavier elements that were ejected from stars as they passed beyond the end of their main sequence lifetime. Higher density regions of the interstellar medium form clouds, or diffuse nebulae, where star formation takes place. In contrast to spirals, an elliptical galaxy loses the cold component of its interstellar medium within roughly a billion years, which hinders the galaxy from forming diffuse nebulae except through mergers with other galaxies. In the dense nebulae where stars are produced, much of the hydrogen is in the molecular (H2) form, so these nebulae are called molecular clouds. 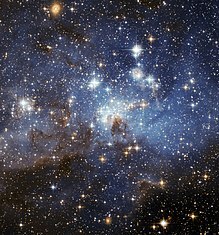 Observations indicate that the coldest clouds tend to form low-mass stars, observed first in the infrared inside the clouds, then in visible light at their surface when the clouds dissipate, while giant molecular clouds, which are generally warmer, produce stars of all masses. These giant molecular clouds have typical densities of 100 particles per cm3, diameters of 100 light-years (9.5×1014 km), masses of up to 6 million solar masses (M☉), and an average interior temperature of 10 K. About half the total mass of the galactic ISM is found in molecular clouds and in the Milky Way there are an estimated 6,000 molecular clouds, each with more than 100,000 M☉. 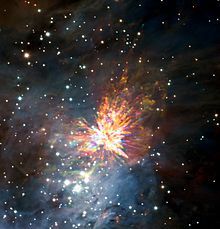 The nearest nebula to the Sun where massive stars are being formed is the Orion Nebula, 1,300 ly (1.2×1016 km) away. However, lower mass star formation is occurring about 400–450 light years distant in the ρ Ophiuchi cloud complex. A more compact site of star formation is the opaque clouds of dense gas and dust known as Bok globules, so named after the astronomer Bart Bok. These can form in association with collapsing molecular clouds or possibly independently. The Bok globules are typically up to a light year across and contain a few solar masses. 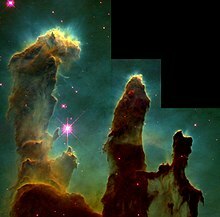 They can be observed as dark clouds silhouetted against bright emission nebulae or background stars. Over half the known Bok globules have been found to contain newly forming stars. An interstellar cloud of gas will remain in hydrostatic equilibrium as long as the kinetic energy of the gas pressure is in balance with the potential energy of the internal gravitational force. Mathematically this is expressed using the virial theorem, which states that, to maintain equilibrium, the gravitational potential energy must equal twice the internal thermal energy. If a cloud is massive enough that the gas pressure is insufficient to support it, the cloud will undergo gravitational collapse. The mass above which a cloud will undergo such collapse is called the Jeans mass. The Jeans mass depends on the temperature and density of the cloud, but is typically thousands to tens of thousands of solar masses. During cloud collapse dozens to ten thousands of stars form more or less simultaneously which is observable in so-called embedded clusters. The end product of a core collapse is an open cluster of stars. In triggered star formation, one of several events might occur to compress a molecular cloud and initiate its gravitational collapse. Molecular clouds may collide with each other, or a nearby supernova explosion can be a trigger, sending shocked matter into the cloud at very high speeds. (The resulting new stars may themselves soon produce supernovae, producing self-propagating star formation.) Alternatively, galactic collisions can trigger massive starbursts of star formation as the gas clouds in each galaxy are compressed and agitated by tidal forces. The latter mechanism may be responsible for the formation of globular clusters. A supermassive black hole at the core of a galaxy may serve to regulate the rate of star formation in a galactic nucleus. A black hole that is accreting infalling matter can become active, emitting a strong wind through a collimated relativistic jet. This can limit further star formation. Massive black holes ejecting radio-frequency-emitting particles at near-light speed can also block the formation of new stars in aging galaxies. However, the radio emissions around the jets may also trigger star formation. Likewise, a weaker jet may trigger star formation when it collides with a cloud. As it collapses, a molecular cloud breaks into smaller and smaller pieces in a hierarchical manner, until the fragments reach stellar mass. In each of these fragments, the collapsing gas radiates away the energy gained by the release of gravitational potential energy. As the density increases, the fragments become opaque and are thus less efficient at radiating away their energy. This raises the temperature of the cloud and inhibits further fragmentation. The fragments now condense into rotating spheres of gas that serve as stellar embryos. Complicating this picture of a collapsing cloud are the effects of turbulence, macroscopic flows, rotation, magnetic fields and the cloud geometry. Both rotation and magnetic fields can hinder the collapse of a cloud. Turbulence is instrumental in causing fragmentation of the cloud, and on the smallest scales it promotes collapse. LH 95 stellar nursery in Large Magellanic Cloud. A protostellar cloud will continue to collapse as long as the gravitational binding energy can be eliminated. This excess energy is primarily lost through radiation. However, the collapsing cloud will eventually become opaque to its own radiation, and the energy must be removed through some other means. The dust within the cloud becomes heated to temperatures of 60–100 K, and these particles radiate at wavelengths in the far infrared where the cloud is transparent. Thus the dust mediates the further collapse of the cloud. During the collapse, the density of the cloud increases towards the center and thus the middle region becomes optically opaque first. This occurs when the density is about 10−13 g / cm3. A core region, called the First Hydrostatic Core, forms where the collapse is essentially halted. It continues to increase in temperature as determined by the virial theorem. The gas falling toward this opaque region collides with it and creates shock waves that further heat the core. Composite image showing young stars in and around molecular cloud Cepheus B. When the core temperature reaches about 2000 K, the thermal energy dissociates the H2 molecules. This is followed by the ionization of the hydrogen and helium atoms. These processes absorb the energy of the contraction, allowing it to continue on timescales comparable to the period of collapse at free fall velocities. After the density of infalling material has reached about 10−8 g / cm3, that material is sufficiently transparent to allow energy radiated by the protostar to escape. The combination of convection within the protostar and radiation from its exterior allow the star to contract further. This continues until the gas is hot enough for the internal pressure to support the protostar against further gravitational collapse—a state called hydrostatic equilibrium. When this accretion phase is nearly complete, the resulting object is known as a protostar. N11, part of a complex network of gas clouds and star clusters within our neighbouring galaxy, the Large Magellanic Cloud. Accretion of material onto the protostar continues partially from the newly formed circumstellar disc. When the density and temperature are high enough, deuterium fusion begins, and the outward pressure of the resultant radiation slows (but does not stop) the collapse. Material comprising the cloud continues to "rain" onto the protostar. In this stage bipolar jets are produced called Herbig–Haro objects. This is probably the means by which excess angular momentum of the infalling material is expelled, allowing the star to continue to form. Star formation region Lupus 3. When the surrounding gas and dust envelope disperses and accretion process stops, the star is considered a pre-main-sequence star (PMS star). The energy source of these objects is gravitational contraction, as opposed to hydrogen burning in main sequence stars. The PMS star follows a Hayashi track on the Hertzsprung–Russell (H–R) diagram. The contraction will proceed until the Hayashi limit is reached, and thereafter contraction will continue on a Kelvin–Helmholtz timescale with the temperature remaining stable. Stars with less than 0.5 M☉ thereafter join the main sequence. For more massive PMS stars, at the end of the Hayashi track they will slowly collapse in near hydrostatic equilibrium, following the Henyey track. Finally, hydrogen begins to fuse in the core of the star, and the rest of the enveloping material is cleared away. This ends the protostellar phase and begins the star's main sequence phase on the H–R diagram. The stages of the process are well defined in stars with masses around 1 M☉ or less. In high mass stars, the length of the star formation process is comparable to the other timescales of their evolution, much shorter, and the process is not so well defined. The later evolution of stars are studied in stellar evolution. 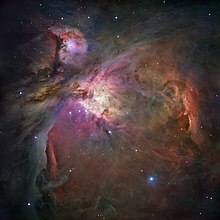 The Orion Nebula is an archetypical example of star formation, from the massive, young stars that are shaping the nebula to the pillars of dense gas that may be the homes of budding stars. Key elements of star formation are only available by observing in wavelengths other than the optical. The protostellar stage of stellar existence is almost invariably hidden away deep inside dense clouds of gas and dust left over from the GMC. 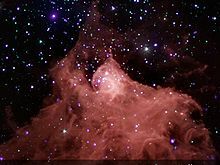 Often, these star-forming cocoons known as Bok globules, can be seen in silhouette against bright emission from surrounding gas. 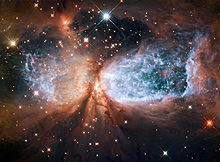 Early stages of a star's life can be seen in infrared light, which penetrates the dust more easily than visible light. Observations from the Wide-field Infrared Survey Explorer (WISE) have thus been especially important for unveiling numerous Galactic protostars and their parent star clusters. Examples of such embedded star clusters are FSR 1184, FSR 1190, Camargo 14, Camargo 74, Majaess 64, and Majaess 98. The structure of the molecular cloud and the effects of the protostar can be observed in near-IR extinction maps (where the number of stars are counted per unit area and compared to a nearby zero extinction area of sky), continuum dust emission and rotational transitions of CO and other molecules; these last two are observed in the millimeter and submillimeter range. The radiation from the protostar and early star has to be observed in infrared astronomy wavelengths, as the extinction caused by the rest of the cloud in which the star is forming is usually too big to allow us to observe it in the visual part of the spectrum. This presents considerable difficulties as the Earth's atmosphere is almost entirely opaque from 20μm to 850μm, with narrow windows at 200μm and 450μm. Even outside this range, atmospheric subtraction techniques must be used. Young stars (purple) revealed by X-ray inside the NGC 2024 star-forming region. X-ray observations have proven useful for studying young stars, since X-ray emission from these objects is about 100–100,000 times stronger than X-ray emission from main-sequence stars. The earliest detections of X-rays from T Tauri stars were made by the Einstein X-ray Observatory. For low-mass stars X-rays are generated by the heating of the stellar corona through magnetic reconnection, while for high-mass O and early B-type stars X-rays are generated through supersonic shocks in the stellar winds. Photons in the soft X-ray energy range covered by the Chandra X-ray Observatory and XMM Newton may penetrate the interstellar medium with only moderate absorption due to gas, making the X-ray a useful wavelength for seeing the stellar populations within molecular clouds. X-ray emission as evidence of stellar youth makes this band particularly useful for performing censuses of stars in star-forming regions, given that not all young stars have infrared excesses. X-ray observations have provided near-complete censuses of all stellar-mass objects in the Orion Nebula Cluster and Taurus Molecular Cloud. The formation of individual stars can only be directly observed in the Milky Way Galaxy, but in distant galaxies star formation has been detected through its unique spectral signature. Initial research indicates star-forming clumps start as giant, dense areas in turbulent gas-rich matter in young galaxies, live about 500 million years, and may migrate to the center of a galaxy, creating the central bulge of a galaxy. In February 2018, astronomers reported, for the first time, a signal of the reionization epoch, an indirect detection of light from the earliest stars formed - about 180 million years after the Big Bang. MWC 349 was first discovered in 1978, and is estimated to be only 1,000 years old. VLA 1623 – The first exemplar Class 0 protostar, a type of embedded protostar that has yet to accrete the majority of its mass. Found in 1993, is possibly younger than 10,000 years. L1014 – An extremely faint embedded object representative of a new class of sources that are only now being detected with the newest telescopes. Their status is still undetermined, they could be the youngest low-mass Class 0 protostars yet seen or even very low-mass evolved objects (like brown dwarfs or even rogue planets). IRS 8* – The youngest known main sequence star in the Galactic Center region, discovered in August 2006. It is estimated to be 3.5 million years old. Stars of different masses are thought to form by slightly different mechanisms. The theory of low-mass star formation, which is well-supported by a plethora of observations, suggests that low-mass stars form by the gravitational collapse of rotating density enhancements within molecular clouds. As described above, the collapse of a rotating cloud of gas and dust leads to the formation of an accretion disk through which matter is channeled onto a central protostar. 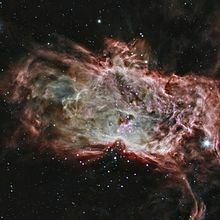 For stars with masses higher than about 8 M☉, however, the mechanism of star formation is not well understood. There is mounting evidence that at least some massive protostars are indeed surrounded by accretion disks. Several other theories of massive star formation remain to be tested observationally. Of these, perhaps the most prominent is the theory of competitive accretion, which suggests that massive protostars are "seeded" by low-mass protostars which compete with other protostars to draw in matter from the entire parent molecular cloud, instead of simply from a small local region. Another theory of massive star formation suggests that massive stars may form by the coalescence of two or more stars of lower mass. ^ Lada, Charles J.; Lada, Elizabeth A. (2003-09-01). "Embedded Clusters in Molecular Clouds". Annual Review of Astronomy and Astrophysics. 41 (1): 57–115. arXiv:astro-ph/0301540. doi:10.1146/annurev.astro.41.011802.094844. ISSN 0066-4146. ^ O'Dell, C. R. "Nebula". World Book at NASA. World Book, Inc. Archived from the original on 2005-04-29. Retrieved 2009-05-18. ^ a b c d e Prialnik, Dina (2000). An Introduction to the Theory of Stellar Structure and Evolution. Cambridge University Press. 195–212. ISBN 0-521-65065-8. ^ Dupraz, C.; Casoli, F. (June 4–9, 1990). "The Fate of the Molecular Gas from Mergers to Ellipticals". Dynamics of Galaxies and Their Molecular Cloud Distributions: Proceedings of the 146th Symposium of the International Astronomical Union. Paris, France: Kluwer Academic Publishers. Bibcode:1991IAUS..146..373D. ^ Lequeux, James (2013). Birth, Evolution and Death of Stars. World Scientific. ISBN 978-981-4508-77-3. ^ Williams, J. P.; Blitz, L.; McKee, C. F. (2000). "The Structure and Evolution of Molecular Clouds: from Clumps to Cores to the IMF". 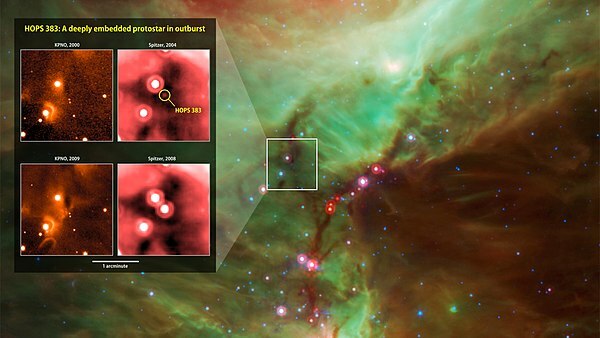 Protostars and Planets IV. p. 97. arXiv:astro-ph/9902246. Bibcode:2000prpl.conf...97W. ^ Alves, J.; Lada, C.; Lada, E. (2001). Tracing H2 Via Infrared Dust Extinction. Cambridge University Press. p. 217. ISBN 0-521-78224-4. ^ Sanders, D. B.; Scoville, N. Z.; Solomon, P. M. (1985-02-01). "Giant molecular clouds in the Galaxy. II – Characteristics of discrete features". Astrophysical Journal, Part 1. 289: 373–387. Bibcode:1985ApJ...289..373S. doi:10.1086/162897. Parsecs to the Orion Nebula Cluster from Very Long Baseline Array Observations". The Astrophysical Journal. 667 (2): 1161. arXiv:0706.2361. Bibcode:2007ApJ...667.1161S. doi:10.1086/520922. ^ Wilking, B. A.; Gagné, M.; Allen, L. E. "Star Formation in the ρ Ophiuchi Molecular Cloud". In Bo Reipurth. Handbook of Star Forming Regions, Volume II: The Southern Sky ASP Monograph Publications. arXiv:0811.0005. Bibcode:2008hsf2.book..351W. ^ Khanzadyan, T.; Smith, M. D.; Gredel, R.; Stanke, T.; Davis, C. J. (February 2002). "Active star formation in the large Bok globule CB 34". Astronomy and Astrophysics. 383 (2): 502–518. Bibcode:2002A&A...383..502K. doi:10.1051/0004-6361:20011531. ^ Hartmann, Lee (2000). Accretion Processes in Star Formation. Cambridge University Press. p. 4. ISBN 0-521-78520-0. ^ Smith, Michael David (2004). The Origin of Stars. Imperial College Press. pp. 43–44. ISBN 1-86094-501-5. 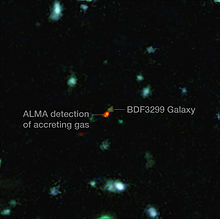 ^ "ALMA Witnesses Assembly of Galaxies in the Early Universe for the First Time". Retrieved 23 July 2015. ^ Kwok, Sun (2006). Physics and chemistry of the interstellar medium. University Science Books. pp. 435–437. ISBN 1-891389-46-7. ^ Battaner, E. (1996). Astrophysical Fluid Dynamics. Cambridge University Press. pp. 166–167. ISBN 0-521-43747-4. 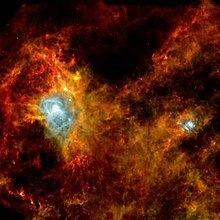 ^ "ALMA Captures Dramatic Stellar Fireworks". www.eso.org. Retrieved 10 April 2017. ^ Jog, C. J. (August 26–30, 1997). "Starbursts Triggered by Cloud Compression in Interacting Galaxies". In Barnes, J. E.; Sanders, D. B. Proceedings of IAU Symposium #186, Galaxy Interactions at Low and High Redshift. Kyoto, Japan. Bibcode:1999IAUS..186..235J. ^ Keto, Eric; Ho, Luis C.; Lo, K.-Y. (December 2005). "M82, Starbursts, Star Clusters, and the Formation of Globular Clusters". The Astrophysical Journal. 635 (2): 1062–1076. arXiv:astro-ph/0508519. Bibcode:2005ApJ...635.1062K. doi:10.1086/497575. ^ Gralla, Meg; et al. (September 29, 2014). "A measurement of the millimetre emission and the Sunyaev–Zel'dovich effect associated with low-frequency radio sources". Monthly Notices of the Royal Astronomical Society. Oxford University Press. 445 (1): 460–478. arXiv:1310.8281. Bibcode:2014MNRAS.445..460G. doi:10.1093/mnras/stu1592. ^ van Breugel, Wil; et al. (November 2004). T. Storchi-Bergmann; L.C. Ho; Henrique R. Schmitt, eds. The Interplay among Black Holes, Stars and ISM in Galactic Nuclei. Cambridge University Press. pp. 485–488. arXiv:astro-ph/0406668. Bibcode:2004IAUS..222..485V. doi:10.1017/S1743921304002996. ^ "Size can be deceptive". www.spacetelescope.org. Retrieved 9 October 2017. ^ Prialnik, Dina (2000). An Introduction to the Theory of Stellar Structure and Evolution. Cambridge University Press. pp. 198–199. ISBN 0-521-65937-X. ^ Hartmann, Lee (2000). Accretion Processes in Star Formation. Cambridge University Press. p. 22. ISBN 0-521-78520-0. ^ Li, Hua-bai; Dowell, C. Darren; Goodman, Alyssa; Hildebrand, Roger; Novak, Giles (2009-08-11). "Anchoring Magnetic Field in Turbulent Molecular Clouds". The Astrophysical Journal. 704 (2): 891. arXiv:0908.1549. Bibcode:2009ApJ...704..891L. doi:10.1088/0004-637X/704/2/891. ^ Ballesteros-Paredes, J.; Klessen, R. S.; Mac Low, M.-M.; Vazquez-Semadeni, E. "Molecular Cloud Turbulence and Star Formation". In Reipurth, B.; Jewitt, D.; Keil, K. Protostars and Planets V. pp. 63–80. ISBN 0-8165-2654-0. ^ Longair, M. S. (2008). Galaxy Formation (2nd ed.). Springer. p. 478. ISBN 3-540-73477-5. ^ a b c Larson, Richard B. (1969). "Numerical calculations of the dynamics of collapsing proto-star". Monthly Notices of the Royal Astronomical Society. 145 (3): 271. Bibcode:1969MNRAS.145..271L. doi:10.1093/mnras/145.3.271. ^ Salaris, Maurizio (2005). Cassisi, Santi, ed. Evolution of stars and stellar populations. John Wiley and Sons. pp. 108–109. ISBN 0-470-09220-3. ^ "Glory From Gloom". www.eso.org. Retrieved 2 February 2018. ^ C. Hayashi (1961). "Stellar evolution in early phases of gravitational contraction". Publications of the Astronomical Society of Japan. 13: 450–452. Bibcode:1961PASJ...13..450H. ^ L. G. Henyey; R. Lelevier; R. D. Levée (1955). "The Early Phases of Stellar Evolution". Publications of the Astronomical Society of the Pacific. 67 (396): 154. Bibcode:1955PASP...67..154H. doi:10.1086/126791. ^ B. J. Bok & E. F. Reilly (1947). "Small Dark Nebulae". Astrophysical Journal. 105: 255. Bibcode:1947ApJ...105..255B. doi:10.1086/144901. Yun, Joao Lin; Clemens, Dan P. (1990). "Star formation in small globules – Bart BOK was correct". The Astrophysical Journal. 365: L73. Bibcode:1990ApJ...365L..73Y. doi:10.1086/185891. ^ Benjamin, Robert A.; Churchwell, E.; Babler, Brian L.; Bania, T. M.; Clemens, Dan P.; Cohen, Martin; Dickey, John M.; Indebetouw, Rémy; et al. (2003). "GLIMPSE. I. An SIRTF Legacy Project to Map the Inner Galaxy". Publications of the Astronomical Society of the Pacific. 115 (810): 953–964. arXiv:astro-ph/0306274. Bibcode:2003PASP..115..953B. doi:10.1086/376696. ^ "Wide-field Infrared Survey Explorer Mission". NASA. ^ Getman, K.; et al. (2014). "Core-Halo Age Gradients and Star Formation in the Orion Nebula and NGC 2024 Young Stellar Clusters". Astrophysical Journal Supplement. 787 (2): 109. arXiv:1403.2742. Bibcode:2014ApJ...787..109G. doi:10.1088/0004-637X/787/2/109. ^ Feigelson, E. D.; Decampli, W. M. (1981). "Observations of X-ray emission from T-Tauri stars". Astrophysical Journal Letters. 243: L89–L93. Bibcode:1981ApJ...243L..89F. doi:10.1086/183449. ^ Montmerle, T.; et al. (1983). "Einstein observations of the Rho Ophiuchi dark cloud - an X-ray Christmas tree". Astrophysical Journal, Part 1. 269: 182–201. Bibcode:1983ApJ...269..182M. doi:10.1086/161029. ^ Getman, K. V.; et al. (2005). "Chandra Orion Ultradeep Project: Observations and Source Lists". Astrophysical Journal Supplement. 160 (2): 319–352. arXiv:astro-ph/0410136. Bibcode:2005ApJS..160..319G. doi:10.1086/432092. ^ Güdel, M.; et al. (2007). "The XMM-Newton extended survey of the Taurus molecular cloud (XEST)". Astronomy and Astrophysics. 468 (2): 353–377. arXiv:astro-ph/0609160. Bibcode:2007A&A...468..353G. doi:10.1051/0004-6361:20065724. ^ "Young Star-Forming Clump in Deep Space Spotted for First Time". Retrieved 2015-05-11. ^ Gibney, Elizabeth (February 28, 2018). "Astronomers detect light from the Universe's first stars - Surprises in signal from cosmic dawn also hint at presence of dark matter". Nature. Retrieved February 28, 2018. ^ Andre, Philippe; Ward-Thompson, Derek; Barsony, Mary (1993). "Submillimeter continuum observations of Rho Ophiuchi A - The candidate protostar VLA 1623 and prestellar clumps". The Astrophysical Journal. 406: 122–141. Bibcode:1993ApJ...406..122A. doi:10.1086/172425. ISSN 0004-637X. ^ Bourke, Tyler L.; Crapsi, Antonio; Myers, Philip C.; et al. (2005). "Discovery of a Low-Mass Bipolar Molecular Outflow from L1014-IRS with the Submillimeter Array". The Astrophysical Journal. 633 (2): L129. arXiv:astro-ph/0509865. Bibcode:2005ApJ...633L.129B. doi:10.1086/498449. ^ Geballe, T. R.; Najarro, F.; Rigaut, F.; Roy, J.‐R. (2006). "TheK‐Band Spectrum of the Hot Star in IRS 8: An Outsider in the Galactic Center?". The Astrophysical Journal. 652 (1): 370–375. arXiv:astro-ph/0607550. Bibcode:2006ApJ...652..370G. doi:10.1086/507764. ISSN 0004-637X. ^ Kuhn, M. A.; et al. (2010). "A Chandra Observation of the Obscured Star-forming Complex W40". Astrophysical Journal. 725 (2): 2485–2506. arXiv:1010.5434. Bibcode:2010ApJ...725.2485K. doi:10.1088/0004-637X/725/2/2485. ^ André, Ph. ; et al. (2010). "From filamentary clouds to prestellar cores to the stellar IMF: Initial highlights from the Herschel Gould Belt Survey". Astronomy & Astrophysics. 518: L102. arXiv:1005.2618. Bibcode:2010A&A...518L.102A. doi:10.1051/0004-6361/201014666. ^ M. G. Wolfire; J. P. Cassinelli (1987). "Conditions for the formation of massive stars". Astrophysical Journal. 319 (1): 850–867. Bibcode:1987ApJ...319..850W. doi:10.1086/165503. ^ C. F. McKee; J. C. Tan (2002). "Massive star formation in 100,000 years from turbulent and pressurized molecular clouds". Nature. 416 (6876): 59–61. arXiv:astro-ph/0203071. Bibcode:2002Natur.416...59M. doi:10.1038/416059a. PMID 11882889. ^ R. Banerjee; R. E. Pudritz (2007). "Massive star formation via high accretion rates and early disk-driven outflows". Astrophysical Journal. 660 (1): 479–488. arXiv:astro-ph/0612674. Bibcode:2007ApJ...660..479B. doi:10.1086/512010. ^ I. A. Bonnell; M. R. Bate; C. J. Clarke; J. E. Pringle (1997). "Accretion and the stellar mass spectrum in small clusters". Monthly Notices of the Royal Astronomical Society. 285 (1): 201–208. Bibcode:1997MNRAS.285..201B. doi:10.1093/mnras/285.1.201. ^ I. A. Bonnell; M. R. Bate (2006). "Star formation through gravitational collapse and competitive accretion". Monthly Notices of the Royal Astronomical Society. 370 (1): 488–494. arXiv:astro-ph/0604615. Bibcode:2006MNRAS.370..488B. doi:10.1111/j.1365-2966.2006.10495.x. ^ I. A. Bonnell; M. R. Bate; H. Zinnecker (1998). "On the formation of massive stars". Monthly Notices of the Royal Astronomical Society. 298 (1): 93–102. arXiv:astro-ph/9802332. Bibcode:1998MNRAS.298...93B. doi:10.1046/j.1365-8711.1998.01590.x.